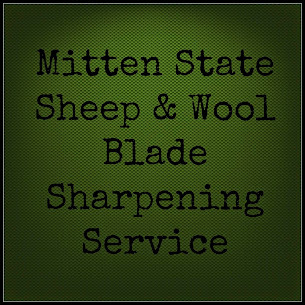 Mitten State Sheep & Wool : Pasture Happenings! It has been a while since we have walked the pasture and taken some shots of the sheep. We were without a camera for a little while and we have been really busy the last couple of weeks. We have added new sheep, separated lambs from the ewes, and then separated the ewe lambs and ram lambs. The ram lambs are in the barnyard. The ewe lambs were put back out on pasture. The new Tunis ewes and lambs were also let out in the pasture. When we get new livestock, we try to keep them separated from our flock for a couple of weeks. During that time we can trim hooves, deworm, and make sure they are healthy before we put them with our sheep. Thankfully, the newbies are fitting right in! There is plenty of grass, but they seem convinced that this grass must be better than the rest! We did buy a young Tunis Ram Lamb. He did not want to stay put the first couple of days. He decided he liked being in the yard the best. Thankfully, after multiple attempts, he finally stayed in the barnyard with the other ram lambs. When we went to the Michigan Fiber Festival, we bought more than wool roving. Meet Emmet, our new Border Leicester Ram. He was bought from ZNK farm. They were nice enough to drop him off on their way home from the sheep show (Michigan Fiber Festival). My daughter Alisha, thinks he is a mix between a teddy bear and an NFL player! He is a yearling, so he still has some growing to do! We are excited to have him! Everyone seems to be settling in. We have to purchase one more Ram and then we should be ready for Fall. The pasture looks a little busier than it has been in quite a long time! Wonderful photos. I can't wait to finish the goat fencing. Then I can share some "pasture photos" of the goats. Your sheep are beautiful. I loving those ears. Congrats on your new additions. They look awesome! Such pretty sheep! Amazing how each breed really is so very different. The new ewes look so pretty. It's funny that they think the same patch of grass is the sweetest. :-) You are really ramping up and busy!